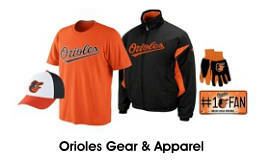 Wild Bill's Apparel proudly features the largest selection of officially licensed Orioles and Ravens T-Shirts & team merchandise to be found anywhere in the Baltimore area. 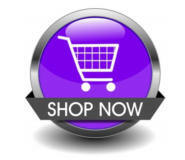 We stock thousands of items, and we're open 7 days a week. 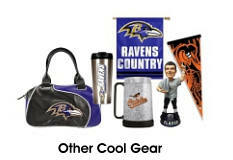 Conveniently located just north of 695 on Belair Road, we are locally owned and operated, and we've been serving Baltimore sports fans with a huge assortment of quality gear for decades. For All Your Sports Thrills, Come to Wild Bill's! 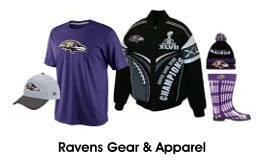 Our MegaStore offers a very unique, fun and comfortable place to shop the biggest selection of Ravens T-Shirts, Orioles T-Shirts, Team Gear and apparel anywhere in town. We have a friendly and knowledgeable staff, big screen TVs to watch the games, private fitting rooms, and secure, off-street parking. We also offer gift cards, and you'll love our discount prices and superior customer service. We want your visit with us to be the most fun and exciting shopping experience ever! We've got the only purple & orange building around, huge red lit eyes on the front of the store, a giant baseball cap over the front door, baseball-bat door handle, and purple lights everywhere - which is just the beginning of our lively decor! Then come in and see the inside! 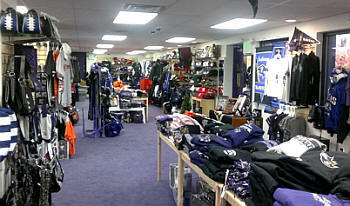 Our plush purple carpet, TVs and music make browsing our thousands of Ravens and Orioles t-shirts and other great items fun, relaxing and enjoyable. 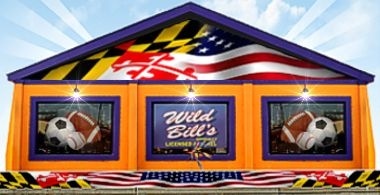 Weekends are special at Wild Bill's, and we often feature free hotdogs, drinks, and a moon bounce for kids!